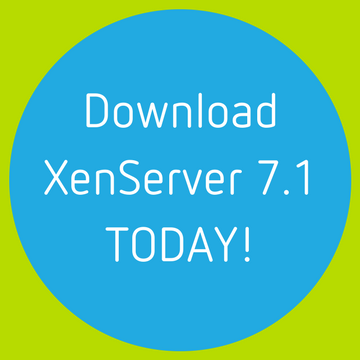 XenServer 7.1 Now Available for Download! Some enterprises — including Citrix customers — prefer to avoid frequent software updates, so they can maintain a stable, reliable virtualization environment. Citrix understands that, and that’s why we introduced the Long Term Service Release (LTSR) for XenApp and XenDesktop … and it’s why we’re now taking that approach with XenServer. XenServer 7.1 is available for download on Citrix.com for customers with customer success services — previously software maintenance — as of February 23, 2017. It introduces the first-ever LTSR for XenServer, which is solidified as the most integrated hypervisor with XenApp and XenDesktop. XenServer greatly accelerates performance while enhancing administrative flexibility and security. Citrix extends its commitment to XenServer by giving you 5 years of mainstream support and the ability to add an additional 5 years of extended support. This release also enhances XenApp and XenDesktop Provisioning Services performance and scalability by accelerating VM boot time by up to 25% while reducing network traffic by up to 98%. It delivers industry-first live patching capabilities that enable real-time, hot patching without virtual machine downtime, no power cycles or workload migrations required, and further simplifies patching by automatically downloading and applying necessary fixes, making it easier than ever to stay up-to-date. XenServer support for Nutanix HCI extends our partnership and platform coverage while XenServer’s unique Direct Inspect APIs integrate with Bitdefender to introduce a new security layer which malware cannot reach nor hide from. Introducing new Provisioning Services (PVS) Accelerator technology that results in up to 25% faster desktop boot up times, up to 98% lower network bandwidth usage, and up to 93% reduced PVS CPU usage. PVS, available to XenApp Platinum and all XenDesktop customers, together with XenServer PVS-Accelerator, increases solution scalability through architecture simplification, which means fewer PVS servers are now required to simultaneously boot the same number or more desktops. Only available with XenServer, PVS-Accelerator simplifies and improves the performance of Provisioning Services (PVS), the de facto large enterprise choice for XenApp/XenDesktop image deployment, and further solidifies XenServer as the most integrated hypervisor for XenApp and XenDesktop. XenServer 7.1 offers its first-ever Long Term Service Release (LTSR), provides more flexibility and choice in how you adopt new XenServer functionality while giving you greater predictability for maintaining and managing the support of your environment. By making this XenServer release an LTSR, you are eligible for up to 10 years of support (5 years mainstream support and 5 years of extended support). XenServer is the only hypervisor to have product lifecycle dates fully aligned with Citrix XenApp and XenDesktop, which radically simplifies infrastructure maintenance for customers choosing to deploy an end-to-end Citrix workspace solution. XenApp and XenDesktop customers are entitled to all of the features of XenServer Enterprise edition, regardless of their XenApp or XenDesktop license type. Previously, only XenApp and XenDesktop Platinum customers were eligible for the in-memory read caching feature, which provides significant performance benefits when using Machine Creation Services (MCS). Now, this feature is available to all XenApp and XenDesktop customers; XenServer simply recognizes your XenApp or XenDesktop licenses and unlocks the full security and performance capabilities of XenServer 7.1. Nutanix customers can now take advantage of unique XenServer features, such as provisioning services, high performance graphics virtualization using NVIDIA GRID vGPU, the enhanced security provided by XenServer’s Direct Inspect APIs, and more. You can now choose Nutanix HCI with XenServer for XenApp and XenDesktop while leveraging these unique integration benefits and avoiding the vTax. Live patching is an industry-first hypervisor capability brought to you in XenServer 7.1. It greatly reduces operational overhead by enabling IT admins to hot-patch their active XenServer hosts without rebooting. This eliminates the need to move VMs between hosts when patching, thus reducing outages and simplifying management of your XenServer infrastructure. This capability is not found on any other hypervisor and has already been proven in production by a tier 1 cloud computing provider for over 6 months. To further simplify patching at scale, XenServer now supports the automated application of fixes to multiple hosts. Automated Updates deploys hotfixes in batches to multiple hosts by automatically downloading necessary fixes from Citrix, installing these patches in the correct order, and rebooting each host once, in sequence, while redistributing VMs to prevent outages. This greatly simplifies XenServer patching and reduces administrative overhead while making it easy to keep your XenServer hosts up to date. XenServer Conversion Manager now offers the ability to migrate Linux VMs from all versions of VMware vSphere to XenServer. Customers wanting to deliver secure Linux virtual desktops and applications from XenDesktop can now easily avoid the vTax by migrating to XenServer. XenDesktop offers IT administrators the flexibility of managing both Windows and Linux applications and desktops within a single console, thus improving administrative efficiencies. Bringing forth a higher level of security visibility and action-ability than ever before within virtual environments, XenServer Direct Inspect APIs, together with Bitdefender Hypervisor Introspection, protects workloads from malware at the hypervisor level. Bitdefender HVI has rich insight of a VM’s memory, while remaining completely isolated from potential threats, helping to protect against zero-day attacks. This unique capability is also available on XenServer 7.0. If you own any edition of Citrix XenDesktop, you’re already entitled to all the features in XenServer 7.1 for hosting your desktop and application workloads and supporting infrastructure; it’s as simple as that! If you’re using it for other workloads, you can purchase XenServer in one of two premium editions — Standard or Enterprise — and you can even use many of the basic features for free! Head over to the XenServer 7.1 feature matrix to see which edition is right for you. If you’ve not tried XenServer before, a 90 day trial is available, and plenty of help is available in the XenServer resource library to get you started. XenServer “Ely” (7.1) is available now, but we’ve been busy working on features for the next release for a good while. What’s inside is all under wraps at the moment, but we’ll let you know more soon!